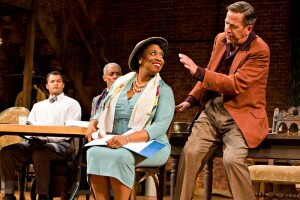 Brandon J. Dirden as John Nevins, Thomas Jefferson Byrd as Sheldon Forrester, E. Faye Butler as Wiletta Mayer and Marty Lodge as Al Manners in "Trouble in Mind." What: “Trouble in Mind,” a play about a 1955 racially integrated theater company that wants to present a race play. Where: Arena Stage, 1101 6th St. SW. When: The play runs through Sunday. Cost: Prices vary depending on seats and showtimes. You can find ticket prices here. Why you should go: The play-within-a-play, set more than 50 years ago, still has relevance today. The black characters are seen confronting racial stereotypes as they work to make it to Broadway. A black and white cast is shown producing a play about a young, southern black man who becomes the target of a lynch mob. Other events to consider: Monday is Food Day, which seeks to promote healthy, affordable and sustainable food. D.C. is home to a number of events, including the Food Day Extravaganza on Woodrow Wilson Plaza. There will be chef demonstrations, entertainment, educational activities and, yes, free food. The event starts at 11 a.m.